Today is the birthday, in 1818 of J. M. Neale. Arguably one of the most influential members of the Oxford Movement that has reached down to our times: who could fail to sing “Creator of the stars of night” without feeling affection for the translator? As with so many members of the Oxford Movement, the church of his birth reviled him for his seeking to discover within the Church of England a Catholicity that looked back further than the reformation in this country. He was assaulted at a graveside for his Ritualistic ways, and denied any preferment, but he worked tirelessly for those committed to his charge, but in terms of spiritual and material welfare. Most of his life was spent as Warden of Sackville College, and he wrote almost 200 books on a wide range of subjects, including the “History of the Holy Eastern Church” to “History of Pews”, and numerous stories for children. 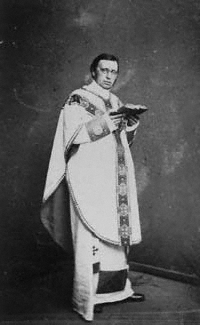 He was also a founder of what is now the Ecclesiological Society, a dangerously ritualistic organisation in its heyday (his connection to it led to his being refused the curacy of St. Nicolas Guildford), and was one of the first in the Church of England to use the chasuble for the celebration of the Holy Communion. He is also credited as the founder of the Society of St. Margaret (SSM), two of whom joined the Ordinariate: this has become the Sisters of Our Lady of Reconciliation. The SSM have had a convent in Walsingham since 1947, and other convents around the world, including Sri Lanka. But it is as a hymn writer and translator that he is best remembered: his entry in the English Hymnal boats over 70 entries, either as translator or original author. He was steeped in literature, with a deep familiarity with English poetry of all eras, as well as one of the finest classicists of his generation. Arguably his best known is “Good King Wenceslas” , but he also translated much of the Office Hymns of the Sarum Breviary, including The Royal banners forward go, Blessed city, heavenly Salem, and The day of Resurrection, as well as the majestic “Come thou Redeemer of the earth”. In all of these he is unsurpassed in the quality of the translation and the poetry of the English. One might question a glittering cradle, but one can’t fault the poetry! He died at the age of 48, on the feast of the Transfiguration, 1866, worn out by his labours. A vital part of the Anglican Patrimony; may he rest in peace. ‹ Three New Deacons for the Ordinariate!